In the first part we compared the performance of the first SMP system for AMD processors and the new AMD Athlon MP with a dual-processor configuration based on the Intel Pentium III CPU. Let me remind you the key conclusions we arrived at. The AMD processors have a greater performance in almost all tests than the Intel Pentium III, even if they work at equal frequencies. The maximum clock speed of the Intel Pentium III for today is 1.2 GHz, while for the AMD Athlon it is 1.4 GHz. At the same time, the cost of their 1.2GHz versions differs three times. 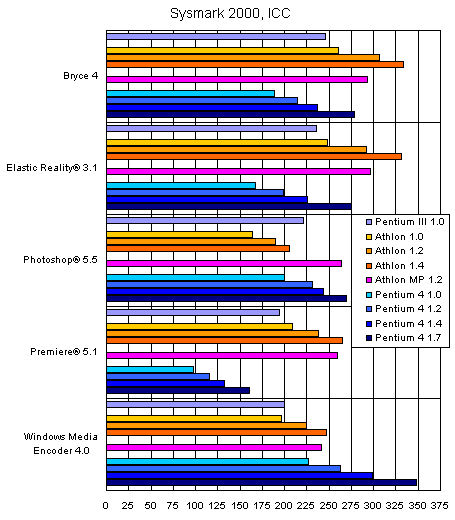 The AMD Athlon falls behind its competitor only in applications optimized for SSE (such as Photoshop 5.5, libraries for operation with MPEG2 from Ligos and some others). But when the SSE support appeared in the Athlon MP, the advantage died out. Remember, though, that the Athlon MP is much costier than its predecessor but it's still cheaper than the Pentium III. Besides, the optimization of its internal structure helped it to outscore the simple Athlon. Moreover, a performance boost in the applications with the SMP support on the Athlon system was 60–70% which a bit more than on the Intel ones. Today we are going to carry out the comparison of the same systems (a Athlon 1.4 GHz is added) with the Intel Pentium 4 system. As you know, this version doesn't support the SMP, and in order to expand the range of results and look how they change and depend on the CPU frequency the Intel Pentium 4 is used with 4 multipliers. This time we have changed the platform for the Intel Pentium III and used the SuperMicro 370DDE board on the Via Apollo Pro266 chipset. This increased the performance (and best of all in the graphics tests) in comparison with the ServerWorks based board. Since we are testing quite a lot of configurations at a time the figures are omitted. The processors of the same type are in close colors. There is nothing unusual in standard business applications. First of all, the Athlon is faster than the Pentium III. Secondly, the Intel Pentium 4 looks quite pale in such tests: at the same frequency it loses to the Pentium III everywhere, and the 1.7 GHz version yields to the Athlon 1.4 GHz in all applications apart from the NaturallySpeaking Perf 4.0. Moreover, its results are almost always worse than those of the Athlon 1.2 GHz. Nevertheless, it can compete at the expense of a higher frequency. The Athlon MP nudges out the usual Athlon everywhere except the NaturallySpeaking Perf 4.0. In the Bryce and Elastic Reality the situation is similar to the business applications. Using the SSE the Photoshop 5.5 throws the Athlons back. However, the new Athlon MP 1.2 GHz catches up with the Pentium 4 1.7 GHz (263 scores against 269). The Pentium 4 results in the Premiere 5.1 are bad as well because this application can be considered well suitable for an architecture of exactly this processor, and it is quite unusual to see that the Pentium 4 1 GHz lags twice behind the Pentium III. But it should be noted that the script used is rather old, and today there is Premiere 6.0 with the code optimized for the Pentium 4. The WME 4.0 is a magnificent example of a flow processing speed of the Pentium 4. Although the WME 4.0 doesn't use SSE/SSE2, the Pentium 4 1.4 GHz outscores the Athlon 1.4 GHz the most considerably - by over 21%! Well, the second processor boosts up the performance by 50–65%. In general, the Pentium 4 is a more beneficial purchase than the Pentium III. But its versions for different sockets can be considered different processors with unexpectedly close speed :). Besides, the i845 based systems work at a less speed, but the price difference for memory (RDRAM vs. SDRAM) allows using its 4 times bigger size. 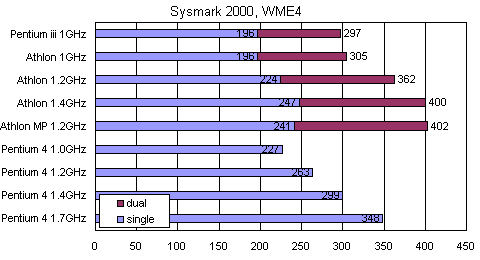 The AMD Athlon processors perform excellently on the old applications of the Sysmark 2000 test which are not optimized for them. And if we take into account only these tests (though it is not objective) the Athlon 1.4 GHz system is the fastest today almost everywhere, and even the 1.7 GHz core and the highly efficient memory do not help the Pentium 4 much. 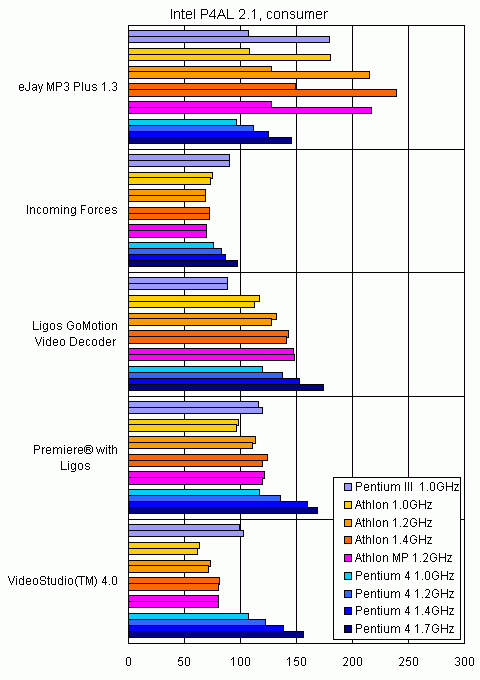 The Athlon MP's results are comparable to the Athlon operating at the same frequency. The latter turns out to be faster in apps with the SSE support the realization of which in the Athlon MP appeared to be quite successful. Note that the Intel's processors are marked in blue, and AMD's ones are in red. For the Pentium III, Athlon and Athlon MP the data are given for uni- (upper) and dual-processor (lower) systems. For the Pentium 4 data for 1.0, 1.2, 1.4 and 1.7GHz are gathered into one block. 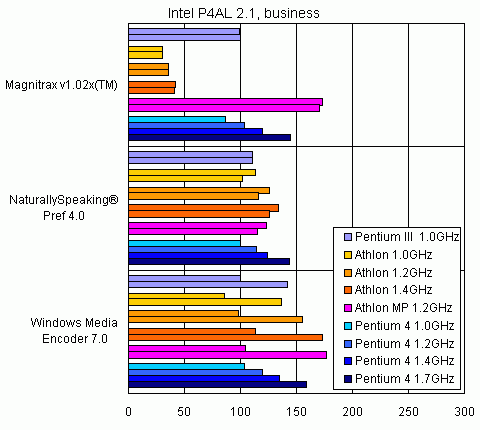 The test results of the Intel Pentium 4 obtained in the P4AL confirm to those published on the Intel's site. Some figures are even higher thanks to the EPoX board. Nevertheless, some results are quite unusual due to special/beta versions of the programs. The program doesn't use SSE and SSE2 instructions that is why the results depend mainly on the frequency. The architecture of the Pentium 4 doesn't shine here. The increase at 200 MHz for the AMD Athlon is 19–22 scores and for the Pentium 4 is only 13–16. Currently the Athlon 1.4 GHz takes almost a 20% lead over the Pentium 4 1.4 GHz, and if the growth will keep further, a 2 GHz AMD CPU will beat the Pentium 4 2 GHz by 23%. The eJay has a SMP support, and the gain from the second processor is considerable -60–70%. This game uses SSE/SSE2 instructions, that is why operation with the Intel CPUs is higher. But, in fact, the SSE support by the AMD Athlon MP is not activated. The Pentium III outdoes even the Pentium 4 1.2 GHz (85 against 83). The SSE2 doesn't help much here. It seems that the SSE is quite enough. Note also that the test failed on one Athlon 1.4 GHz processor that is why the result is the same as on two processors. Despite the fact that the base system was built on the Intel Pentium III 1 GHz, nobody managed to outdo it except the Pentium 4 1.7 GHz. 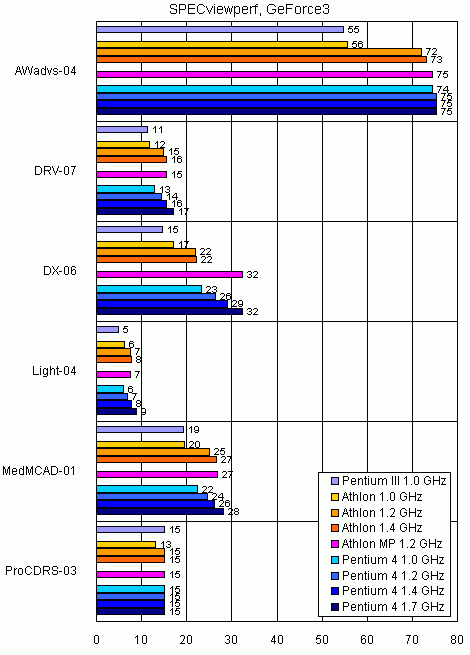 It is interesting that the Athlon 1.0 GHz outperforms the Athlon 1.2 GHz (75 against 68). The Pentium 4 1.4 GHz falls behind the Pentium III. This program of MPEG2 playback uses SSE/SSE2 instructions. The Pentium 4 benefits from the SSE2 by 20% (as compared with the SSE). The Athlon MP 1.2 GHz comes very close to the Pentium 4 1.4 GHz despite the SSE2 used. The AMD Athlon performs excellently. The Athlon 1.0 GHz wins over the Pentium III 1.0 GHz by 32%. The Ligos libraries work with SSE instruction, but the last version knows the SSE2 as well. The SSE is less effective in this test than in MPEG decoding in the GoMotion Video Decoder. At the expense of a higher frequency and the SSE support the Intel Pentium 4 wins. The situation is the same as the tasks are similar and the test is from the same developer. The AMD lags farther behind. The SSE is used here. The 66% difference (at 1.2GHz) is quite amusing. All apps use equal instructions. It is interesting that the AMD processors take a 8–13% lead over the Pentium 4 working at the same frequency. This version supports the SSE which allows the Intel to outdo the AMD Athlon. But the SSE effectiveness is not high. 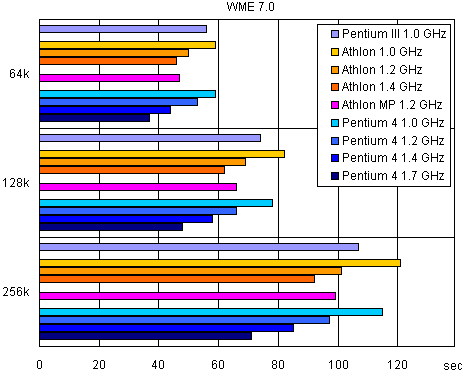 The Windows Media Encoder 4.0 results for the Pentium III 1.0 GHz and Athlon 1.0 GHz coincide, while the gap of the Athlon in the 7.0 WME is now 11%. In general, the Intel Pentium 4 is faster than its competitor. The new architecture and higher frequencies helped it a lot. But in some applications the effective SSE2 realization matters quite much. ProCDRS-03: the video card is obviously limited. The Athlon 1.0 GHz works unexpectedly slower than the Pentium III. The speed depends on the processor in 3 tests out of 6 where the Athlon processors compete successfully against the Intel Pentium 4. The Athlon MP 1.2 GHz works at the level of the Athlon 1.4 GHz. The first and the last tests show almost equal results for all participants which means a fps limitation by the video card. 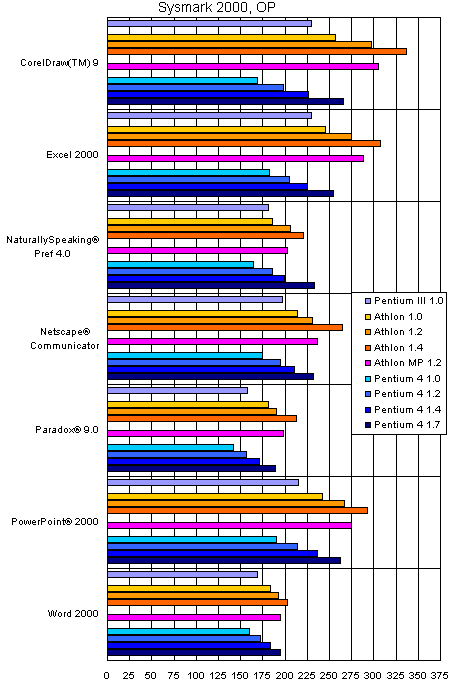 It is not strange that the Athlon MP outscores the Pentium 4 (we could see such results in the eJay MP3 Plus 1.3). But it is unclear that the Athlon 1.2 and 1.4 GHz have similar results (taking into account that this test works only in a window of 700X700, and the scene is not very complex: specdx06.jpg (55 KBytes)). AWadvs-04, here Pentium 4 with the RDRAM goes much ahead. The AMD-760MP falls strongly behind. ProCDRS-03: here the video card also limits the performance! It is interesting that the 1.0 and 1.2 GHz Athlons go on a par. The biggest difference is found in the 3 and 4 subtests which reflect exactly the wireframe model. 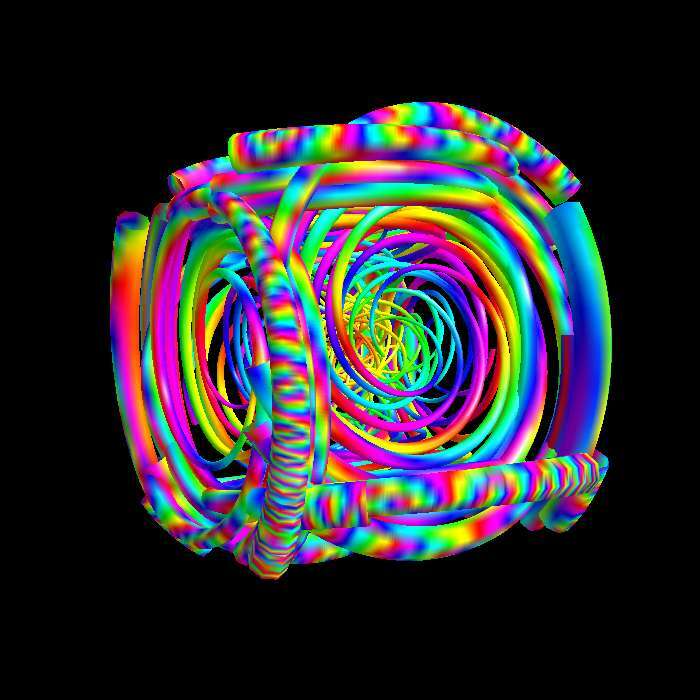 In the ProCDRS-03 it is the same: the speed grows significantly due to wireframe models. Well, the conclusion is that in combination with the professional accelerator the system of the Intel Pentium 4 and RDRAM takes the first place. 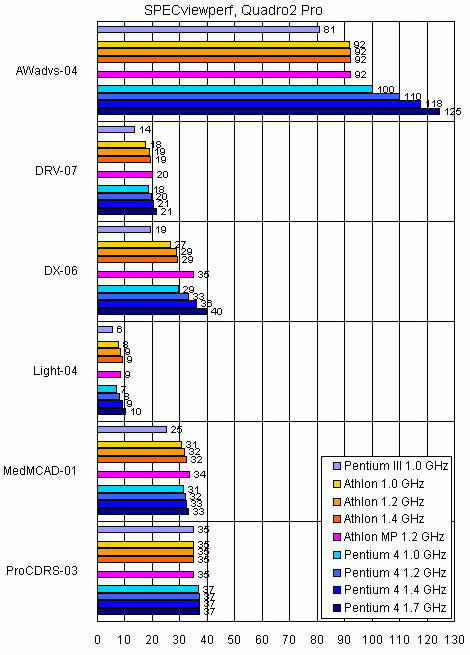 The AMD Athlon MP comes the next followed by the rest of Athlon CPUs. The Intel Pentium III comes the last. The evident leadership of the Pentium 4 is noticeable only in the AWadvs-04 and DX-06. In the MedMCAD-01 the Athlon MP takes a lead. In the other tests the scores are very close. In case of a game video card (even if it is rapid enough) in the SPECviewperf test the advantage of combinations of the Pentium 4/RDRAM or Athlon MP/DDR RAM will be noticeable only in the DX-06 (IBM Visualization Data Explorer). It is one of a few applications where the Intel Pentium 4 scores the superb results. Its 1.2 GHz version outclasses even the Athlon 1.4 GHz. The Athlon MP 1.2 GHz catches up with the Athlon 1.4 GHz. 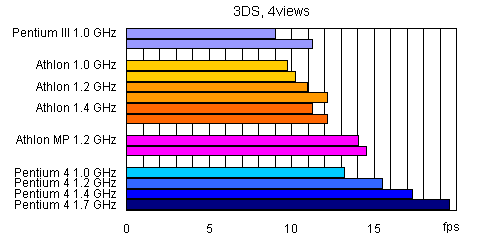 The results are similar to the P4AL. At 64K the junior Athlon almost caught up with the Pentium III despite the SSE support by the latter, but at higher speeds the gap is 13%. The Athlon MP doesn't yield to the 1.2 GHz Pentium 4 at 64 and 128Kbit/s. The tests for 384 and 768Kbit/s speeds have too close results with those of a 256Kbit/s speed. The SSE/SSE2 instructions are not used here, that is why the outcome depends on the frequency and the architecture. The AMD processors outclass all Intel ones at the same clock speed, while the Athlon MP 1.2 GHz is more efficient than even the Pentium 4 1.4 GHz. The last two tests are carried out in the 3DStudio MAX 3.0 program which uses SMP in case of frame rendering and standard settings and is not optimized for any processor. For the Pentium III and Athlon the results are obtained also for SMP configurations. The AMD Athlon takes the lead. The Pentium 4 unexpectedly falls behind. And the Athlon with its fast FPU which allows parallel implementation of many instructions operates rather efficiently. The second processor boosts up the performance considerably. The second test measures the drawing speed of a standard scene 4views.max in 4 windows. The drawing scene on the Pentium 4 is superb! At 1.4GHz it outscores the respective Athlon by 40%. And it is only the Athlon MP that is able to compete against the Pentium 4 1.2 GHz. All modern platforms ensure a high performance in the majority of business applications. The Intel Pentium 4 is not striking in the most of old applications of the Sysmark 2000 test. The Athlons are unequaled leaders here. In more resource-demanding tasks it is not only the CPU speed that matters; you should account also for its bus, the internal architecture and MMX/SSE/SSE2 support. In general, a high core frequency of the Pentium 4 and its SSE/SSE2 support makes its a leader in the programs which utilize MPEG2 libraries of Ligos. But the SSE realization in the Athlon MP is more efficient, and this processor competes with the higher-clocked Pentium 4. 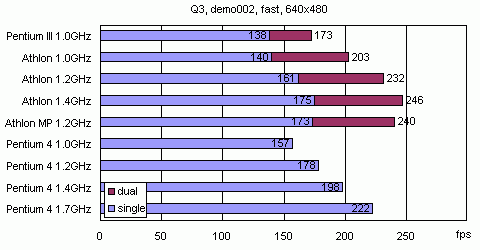 The SPECviewperf showed that a higher core speed doesn't mean a better performance. 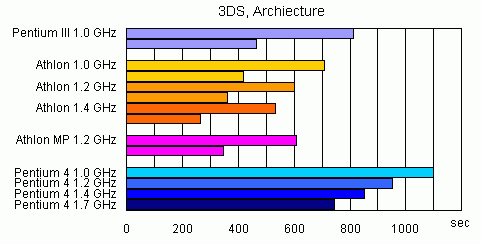 On the whole, the Pentium 4 with RDRAM is leading, but the other contestants do not lags considerably behind. The Quake 3 Arena makes the Pentium 4 a winner. 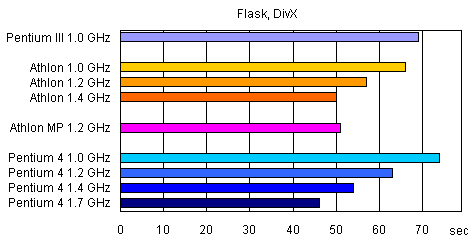 The multimedia files processing in the WME and Flask showed that the internal CPU frequency is of the greatest importance here. The AMD Athlon and Intel Pentium 4 working at the equal frequencies obtained similar results. Only in the WME 7.0, probably because of the SSE support, the Intel processors lead, while in the Flask the victory is won by the AMD.